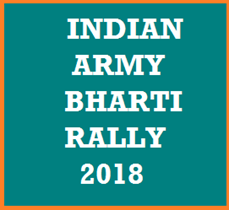 Indian Army Bharti Rally 2018: ARO Jammu and Srinagar has going to conduct an open Bharti rally for the posts of soldier general duty, soldier technical, soldier clerks/storekeeper, Nursing assistant and soldier tradesman for the candidates of Jammu, Kathua, Samba, Udhampur, Poonch, Rajouri, Doda, Kishtwar, Ramban and Reasi Districts. The online registration process will start on the official website of the Indian Army, interested candidates can apply online before the last date. 10+2 with PCM and 50% Marks in aggregate and 40% marks in each subject. Selection will be based on candidates performance in online written test, physical & medical tests in rally.